After the truss rod mishap I ordered two more rods, which arrived yesterday. More about this later. Previously I scraped and filed down the bindings, using a spokeshave and a file. After that I began sanding. It is darn near impossible to ever get out every last tiny scratch on a guitar, simply because no matter how much you inspect it, inevitably you will miss something. That is why I take the guitar outside to examine it. But even so, I’m sure I missed something. I also made a new neck blank and routed the dovetail, then fitted it. The fitting went well, since I knew the precise angle to cut, and had a good idea of how much filing would be required to straighten it up afterwards. They always need fine tuning. 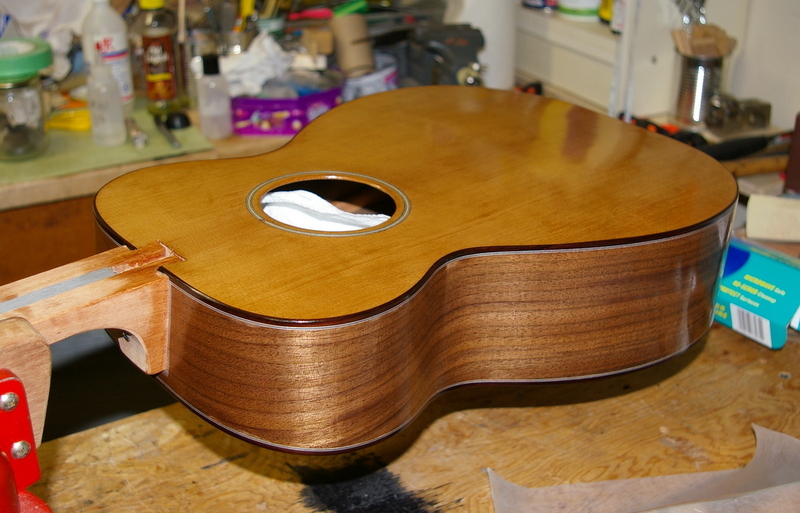 However, sooner or later the moment arrives when you have to begin applying the finish. My preferred finish is shellac. 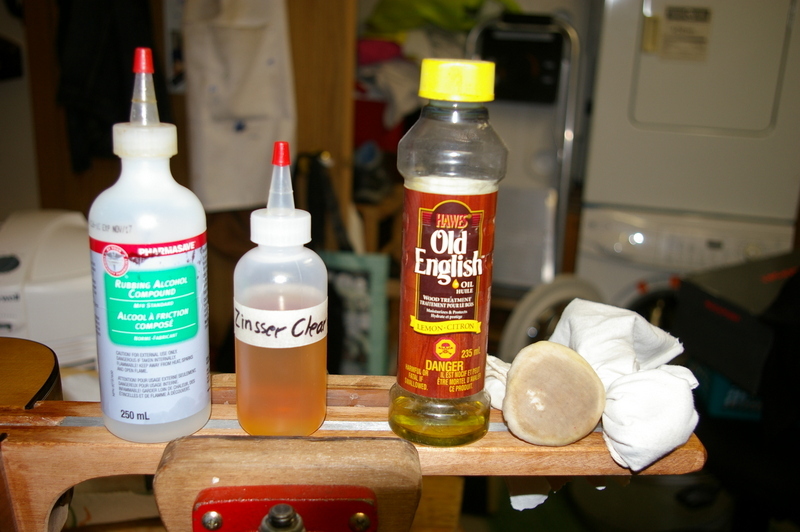 Old school, plain shellac is naturally derived, non toxic, easy to remove or add to, and gives good protection to wood on an instrument. Most other coatings are toxic, smelly, and not as beautiful in colour as shellac. You can also spray shellac now, which I have done with good results. This time I’m rubbing it on though, the old way with a little bag (called a mouse) made of cotton batting wrapped in cotton cloth. It’s an old technique but it works well once you get the hang of it. If you goof it up you can always wet sand it with super fine emery paper and oil. I often do that between sessions to level the finish and remove various swirls and fingerprints. Shellac is very soft at first but hardens up eventually. Patience is required. I try to remember this each time I begin french polishing. 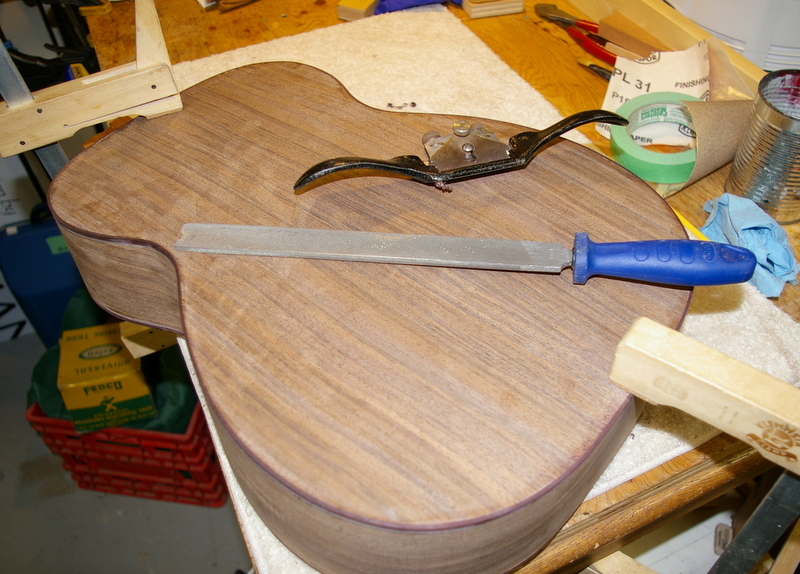 Guitar body after one french polishing session – guitar is held in vise with the old neck re purposed as a handle for finishing. There is a screw on the heel locking it together. There are now many videos on YouTube about french polishing. Some are useful, some are horrible. Basically there are no short cuts to a good job. Never try to apply shellac to a guitar or fine furniture with a brush! Practice on a piece of scrap wood first is the best advice. Back to the truss rods. The replacement rod and another similar one arrived together by courier. The new type rod has a steel casing, as opposed to the aluminum case of the first one. It feels much heavy as a consequence. But it it also one inch longer. Which means it will not fit, after all. This guitar has a 25″ scale, which is not that unusual, so I have no idea why the manufacturer of this long rod made it so long. I will thus once again go ahead with the original type rod, but there is no way that I will be gluing it into the neck this time.